It sequences the concept the right way round. Although we usually refer to it in the sequence 70:20:10, we generally acquire it the other way round, i.e. we start by learning something in a structured environment before moving on to team interaction and eventually, gaining experience. It explains the concepts well. It presents an honest and qualified view of the importance (or lack of importance) of focusing on the numbers. Let's put the numbers aside for the moment and agree that 70:20:10 works. Our question is how to apply it to your corporate training software. I'm sure this won't surprise everyone, but we Corporate Training Software vendors have less implementation experience than most of you. We are not L&D professionals, trainers or assessors.So if its true that Corporate Training Software vendors have less experience than you, then why is an LMS vendor lecturing you about optimal corporate training and how to implement 70:20:10? I think it has less to do with experience and more to do with a different point of view. Making established processes work in cloud applications presents new ways to view and solve problems. I'm not advocating that we look for a pure "tech solution" for every corporate training software problem, but when it helps to streamline, saves time and effort and delivers an effective result its worth it, right? As I suggested in my last article, face-to-face training won't disappear in a hurry. And that's how many of us want corporate training software to remain. What is 'xAPI' and how can it help with corporate training software? Until very recently, the Shareable Content Object Reference Model (SCORM) was the preferred protocol for eLearning. In simple terms, SCORM is an eLearning platform that enables you to deliver electronic content, have your learners interact with the course and quizzes, and have their results transferred to a compliant Learning Management System (LMS). In theory, xAPI provides a convenient way to deliver corporate training, learning and development in new corporate training software solutions. But it's no secret! SCORM has limitations and these limitations are the real reasons so many learning professionals are dissatisfied with eLearning as a tool for delivering effective corporate training and workforce development. So what are the limitations of SCORM? Most of the limitations revolve around SCORM's inability to record the 'whole' learning experience. You'll only ever know the students training profile within the limited context of the online course(s) the student signed up for. SCORM knows nothing about the learner's interactions with mentors and colleagues, practical assessments, prior learning or work experience. 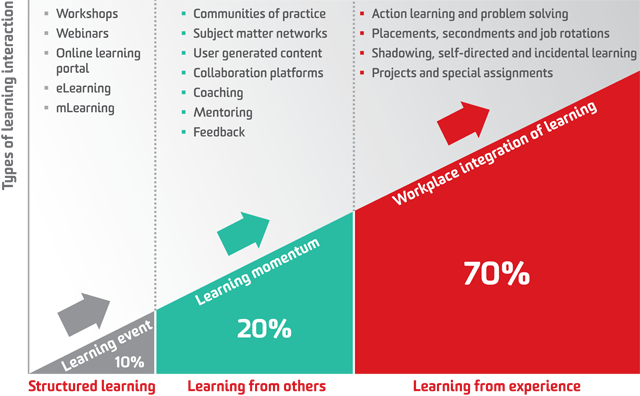 So in terms of Staff Training and the 70:20:10 concept, that kind of corporate training can only ever deal with the 10% (Structured Learning) at best. Interaction in SCORM is only possible through online quizzes and menu actions that a computer can mark, e.g. multi-choice, fill-in-the blank etc. This greatly limits assessment capabilities. SCORM provides no mechanism for team / group activities. Learning is experienced and tracked at an individual level. SCORM doesn't allow for learning experience across multiple platforms and modalities. Basically, you'd have to commence and complete your online course on a single device. And any face to face, webinar, social learning or work experiences would be excluded. Until fairly recently, ALL SCORM content had to be delivered in FLASH which made SCORM courses unsuitable for mobile devices. Today, almost all SCORM authoring tools support HTML 5 and offline mode (disconected from the internet). 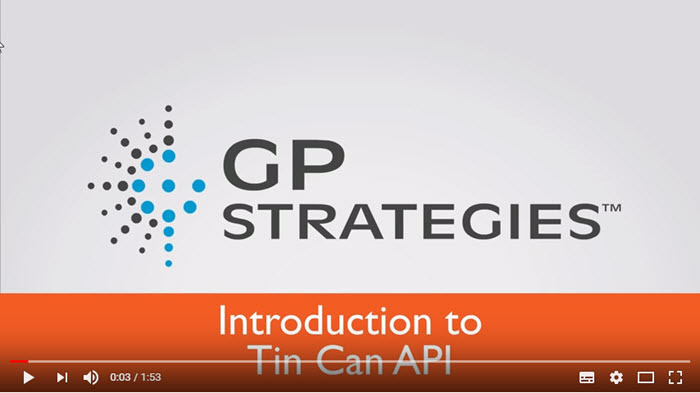 Tin Can API project was the working title used by Rustici Software, the developers of the new standard. The Tin Can API was released in 2013 and formally named Experience API (xAPI). As a tool for corporate training and development, xAPI plugs many of the gaps identified in SCORM. In particular, xAPI can be used to track individual and group learning experiences on-line learning, face-to-face training and assessment, work-place training, social learning, experiences across multiple devices, and all sorts of interactions. So SCORM can still be used to deliver online content, but intead of recording only results that relate to that online content xAPI enables you to record ALL related learning experiences. The main reason xAPI succeeds where SCORM failed is its ability to record and track any learning experiences. LMS Vendors like Bluegem are able to use code in the form of "xAPI Statements" to track online, face-to-face, mentoring activities, group interactions, social learning and activities collected across multiple devices. How does this help with Staff Training? In short, anything you might want to achieve in a 70:20:10 program can potentially be recorded and tracked through xAPI, including the 20% interactivity component mentors and colleagues, and most importantly the 70% experience component which is a major part of any effective staff training program. For many industry professionals maintaining currency in a role or capability is vital. For Public Safety officers in the fire and emergency services; Financial Planners, Real Estate Agents, and Medical Professionals CPD is a mandatory requiremnet when depoying trained and cpable resources.The good news, xAPI can also be used for the PD components of corporate training. It helps track, assess and verify ALL learning interactions and experiences. When a learner attends a conference, refresher course, significant incident or an online course xAPI track and records the learner activities. In this way you can build a complete picture of the learner's experiences across multiple contexts. xAPI provides measurable results to accumulate and validate CPD points. What about other approaches, non xAPI? The key benefit of xAPI in corporate training software is its interoperable interface. It enables participating platforms and systems to share in the collection and storage of learning experiences. For example, your web browser can now initiate xAPI Statements, making it capable of transparently recording the learners browsing experiences. The LMS can use these records to record 'incidental' or 'social' learning. Acronyms! Acronyms! the Tin Can API team came on a new type of "LMS" called the Learning Records System (LRS). Basically, it stores learning experiences as records. What if your Learning / Student Management System doesn't support xAPI? Yes, it is possible to design student management and learning management systems that can integrate and track both online, face-to-face and blended learning. Bluegem and several other SMS/LMS vendors have had this capability for over 10 years. However, these are what we call monolithic systems meaning they can only capture experiences within their control, but if these systems don't participate in an interoperable standard like xAPI, they wont be able to share those captured experiences with other systems and devices as you would expect with good corporate training software. To put it another way, the major limitation of a monolithic system is that it only records what happens within it's environment. But systems that collaborate to a common set of "interoperable standards" like xAPI can share learning experiences across multiple platforms. They can collate records to create a more complete learner profiles. In summary, SCORM content and Learning Management Systems (LMS) could only interoperate within a avery restricted eLearning context. It was possible to integrate multiple types of experiences with a carefully designed 'monolithic' LMS. But xAPI enables multiple Systems from participating vendors to effectively exchange any type of learning data. The standard for exchanging data is xAPI, which uses Tin CAN API Statements to communicate, track and verify ANY kind of learning experience. Student Mary Jane (Actor) completed (Verb) assignment 406HLB03-Assignment 1(Object). The ststement has an ACTOR who does something, a VERB, the action undertaken and, usually an OBJECT, the item on which the action was performed. As you can see this is generic, and therefore not limited to eLearning.